Diamond presents interesting, unique properties such as unsurpassed nuclear stability, extreme hardness, high heat conductivity, a high refractive index, a wide indirect electronic band gap, high electron and hole mobility, resistance to chemical attacks due to the high strength of covalent carbon bond and the small interatomic distance between the carbon atoms in the diamond lattice, and thus has found a wide variety of applications in modern science and technology. Each carbon atom in diamond is tetrahedrally bonded to its four nearest neighbours. The configuration of the valence electrons in carbon is a combination (called hybrids) of s and p orbitals. Graphite is one example with an sp2 type, while diamond is of an sp3 form. Figure 2624a illustrates the hybridization process for diamond. During this process, the energy levels of the 2s are raised while the 2p levels are reduced so that the four sp3 orbitals have an identical energy, resulting in a more favourable lower energy system. In this case, these four valence electrons form σ bonds. Figure 2624a. Schematic illustration of the process of hybridisation for carbon. Each carbon atom in diamond forms a series of sp3 hybridised atomic orbitals. The schematic illustration in Figure 2624b shows the bonding levels for diamond in a different way. When the hybrid carbon atoms bond they form a series of four bonding and four antibonding orbitals. In a large diamond structure involving many carbon atoms, these energy levels form a continuous band structure represented by the valence and conduction bands. Figure 2624b. 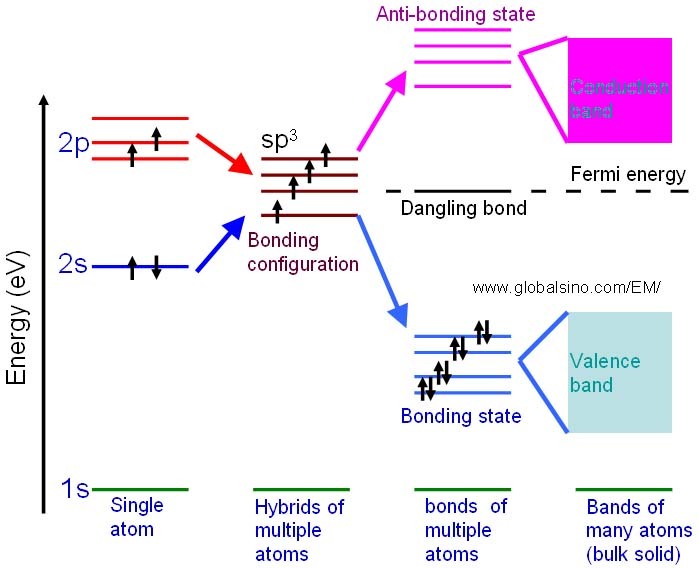 Schematic illustration showing the progression of the electronic structure for an sp3 bonded system. The sp2 bonded solids have both σ/σ* and π/π* states available to the electrons, while for sp3 bonded solids only the σ/ σ* states present. For the diamond and graphite, electron transitions to these states generate many of the characteristic features in EEL spectra. For instance, in core loss spectra from diamond, the excitation of the 1s electrons to the σ* states generates the carbon k edge peak. For graphite, the transitions of the inner shell electrons into unoccupied π* states give a peak prior to the edge onset. In the valence band, valence electron transitions into the π* states also produce a peak at around 6 eV. A microtome for specimen-sectioning is a tool used to cut extremely thin slices from bulk material. Specimens in thickness between 50 nm and 100 µm can be prepared for both transmission light microscopy and transmission electron microscopy. This method use steel, glass, or diamond blades depending on the specimen being sliced and the desired thickness of the sections needed. For instance, in industry, grade diamond knives are used to slice hard materials such as bone, teeth and plant matter for both light microscopy and electron microscopy. Note that the materials might damage the knives. As listed in Table 2624a, substances with large bonding energies usually have high melting temperatures. Table 2624a. Bonding energies and melting temperatures of covalent substances. Table 2624b. Other characteristics of Burgers vectors of diamond. Table 2624c. Properties of diamond.